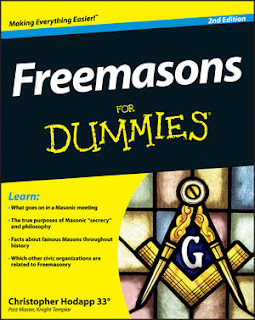 Every Mason lives for a great Festive Board. (We all weighed 110 pounds when we joined this fraternity, right?) 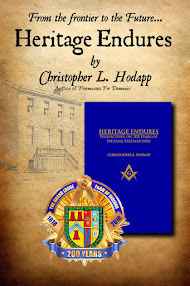 After all - the founding of the Grand Lodge in London in 1717 was to revive the occasion of the Annual Assembly and Feast. Cold spaghetti on paper plates is no way to celebrate the world's greatest gentlemen's fraternity. A lodge dinner should be a feast! In the true spirit of that sentiment, I bring your attention to this curiosity today, from the NPR show website for The Salt. 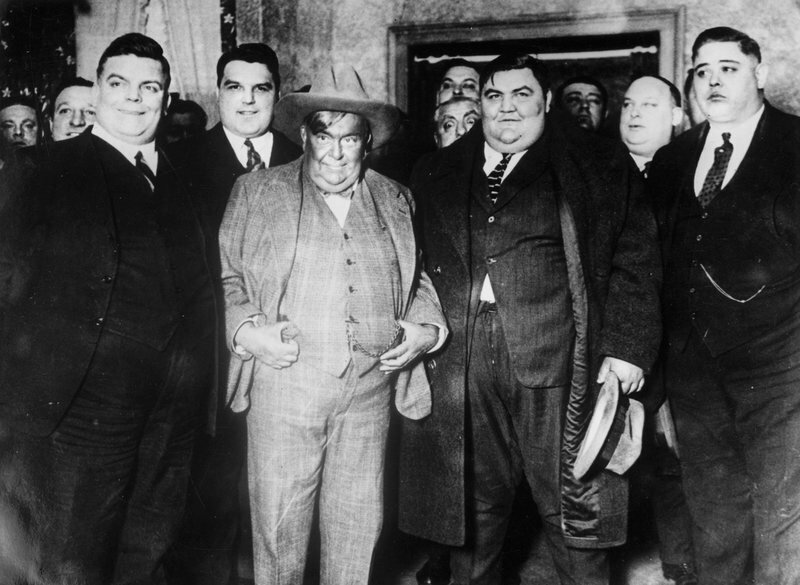 In 1903, in a cheery local tavern tucked away in Wells River, Vt., one of America's most successful fat men's clubs was launched. "This village is full of bulbous and overhanging abdomens and double chins tonight, for the New England Fat Men's Club is in session at Hale's Tavern. The natives, who are mostly bony and angular, have stared with envy at the portly forms and rubicund faces which have arrived on every train." 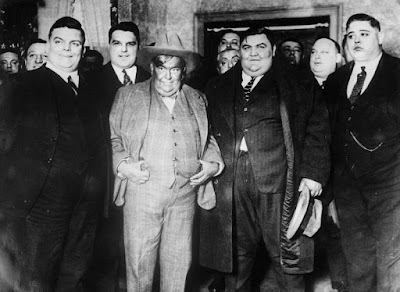 The fat men's clubs of the late 19th and early 20th centuries were spectacular celebrations of the wealth and chubbiness of a bygone era. At once sociological curiosity and anthropological artifact, these clubs were a vestige of perhaps the last time society found corpulence to be worthy of celebration. Weigh-ins were a competitive event. A New York Times article from 1885 describes the crestfallen reaction of a member of a Connecticut fat men's club upon stepping on the scale. "I must weigh over 300 pounds now," George Kapp boasted. Alas, he came in at a disappointing 243. As the Times reported, "His friends thought he shrank at least 20 pounds more from grief before evening." Daryl Leeworthy, a historian at the U.K.'s Swansea University, says that fat men's clubs weren't just an East Coast phenomenon. Nevada, Utah and Tennessee boasted versions as well. And he says the clubs weren't just venues to celebrate the joys of eating without concern and brag about one's girth. They were, essentially, networking events. Memphis' fat men's baseball club had a reception committee replete with judges, ministers and a rabbi, he says. Populist Democrat William Jennings Bryan traveled to a Fat Men's Club in Concord, Mass., to drum up support for one of his presidential runs, Leeworthy says. What did one do at a fat men's club gathering? Well, eat, of course — a lot. At its peak, the New England's Fat Men's Club had 10,000 members, according to writer Polly Tafrate's brief history of the club for Upper Valley Life. The men would cram huge breakfasts into their bellies, then stumble outside and work up a sweat in a friendly Olympics-style competition showcasing strength and virility: leap-frog contests, broad jumps and races, Tafrate writes. "One nine-course menu included oyster cocktail, cream of chicken soup, boiled snapper, fillet of beef with mushrooms, roast chicken, roast suckling pig, shrimp salad, steamed fruit pudding with brandy sauce, assorted cakes, cheese and ice cream followed by coffee and cigars. The evening was laced with large portions of wit, sarcasm and roaring laughter." I hope they didn't fill up on bread! As a Junior Warden, I'd love to provide my brethren with a "feast" but it's very hard when many of the Past Masters think they should pay the same amount for a catered meal in 2016 as they did in 1972! A great experience must be paid for, Brethren. Isn't a memorable Festive Board worth the cost of a tank of gas?